Winter solstice yule is around December 21st/22nd (or near those dates) and it's the time of greatest darkness and also the longest night of the year. Winter solstice yule is a time if great symbolism and power. This time of year is celebrated with friends and family. Winter solstice yule crafts includes Christmas crafts such as the Nativity scene, paper lanterns, Yule greeting cards, Yule log and ornaments. Celebrate the Solstice - It's no wonder that lights are part of every winter celebration. Twinkling against the backdrop of winter's darker days, they stand out as festive and cheery, especially on the longest night of the year--the winter solstice (December 22). 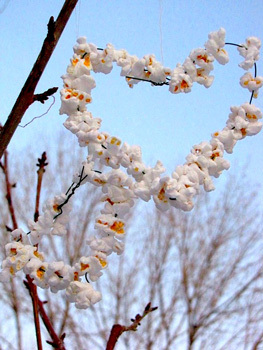 Feed the Birds - Show the birds how much you love them with this popcorn heart. 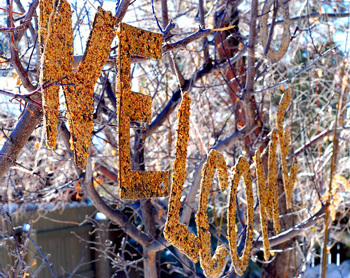 Feeding Wild Birds - Welcome the birds with a welcome sign made from bird seed! How To Make a Pagan Nativity Scene For Yule : Pagan Nativity Scene - So your neighbors all have cute little mangers in their yards, complete with plastic baby Jesus, light-up sheep, and a couple of Wise Men who have probably seen better days. Are you feeling a bit left out? After all, as Pagans, we don't really do the baby Jesus thing. But don't feel bad -- you can still set up a Nativity scene (or something close to it) that represents your Pagan or Wiccan beliefs. You can do this either in a large version to display on your lawn, or a smaller scale for indoor festivities. How to Make a Yule Log for Winter Solstice - On Yule, the sun stops its decline into the south. For a few days, it seems as though it’s rising in exactly the same place… and then the amazing, the wonderful, the miraculous happens. The light begins to return. 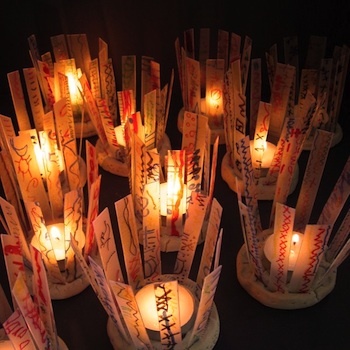 Lovely Tea Light Holders - Make these tea light holders from a base clay and decorated plastic strips. Pipecleaner Pentacles Ornament - Use three chenille stems to shape this pent - - one makes the circle, and the other two get folded around to form the star. Reindeer Food for Yule - If your family still gets visits from Santa Claus, it's traditional to leave out a plate of cookies and some milk for him -- after all, it's hard work flying around the whole world in one night. But what about his reindeer? They do most of the work, so why not leave a treat for them too? 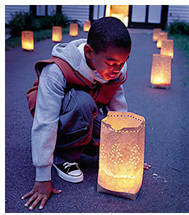 You can scatter it on the lawn before your kids go to bed, or leave it in a bowl near the stockings. Yule Greeting Cards to Make On Your Own- It's hard to find Yule greeting cards commercially, and often when you do locate one you like, they can be expensive. Because there's not a huge market for Pagan or Wiccan greeting cards, sometimes it's just easier to make your own. With a little imagination -- and a couple of kids to help out if possible -- it's really easy to make stylish Yule cards that your friends will love. You can make a couple of different kinds of cards, depending on how much time you have, and your level of craftiness.